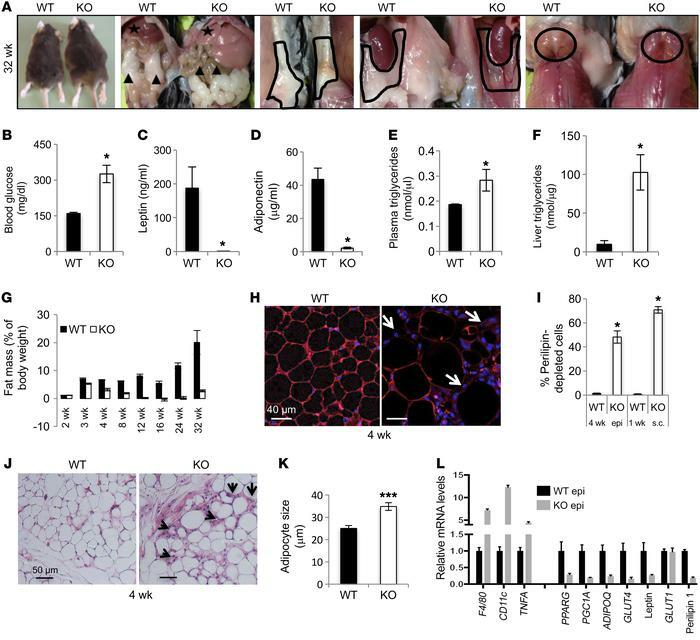 Adipocyte-specific SNAP23-KO mice display severe lipodystrophy associated with liver steatosis and adipose tissue inflammation. (A) Thirty-two-week-old male KO mice had extended abdomens (first panel on left) with enlarged, pale livers (star in second panel from left), loss of epididymal adipose tissue (triangles in second panel from left), subcutaneous adipose tissue (inside outlined shapes in third panel from left), perirenal adipose tissue (inside outlined shapes in fourth panel from left), and interscapular BAT (circle in last panel on right). (B) Plasma glucose, (C) leptin, (D) adiponectin, and (E) triglyceride levels were determined as described in Methods. (F) Hepatic triglyceride content was normalized to total protein levels (n = 5 WT mice and n = 5 KO mice). (G) Echo-MRI analysis of total fat mass in Snap23fl/fl (WT) and adipocyte-specific SNAP23-deficient (KO) mice at 2, 3, 4, 8, 12, 16, 24, and 32 weeks of age (n = 5–10 mice). (H) Perilipin immunofluorescence (red) and DAPI staining (blue) for nuclei in epididymal adipose tissue from 4-week-old WT and KO mice. Arrows indicate perilipin-depleted cells. Scale bars: 40 μm. (I) Quantification of perilipin-depleted cells was performed on epididymal adipose tissue (epi) from 4-week-old mice and subcutaneous adipose tissue (s.c.) from 1-week-old mice. (J) Epididymal adipose tissue from 4-week-old WT and KO mice was fixed, stained with H&E, and examined by light microscopy. Arrowheads indicate selected areas of inflammation and the presence of crown-like structures. Scale bars: 50 μm. (K) The relative diameter of the morphologically normal–appearing adipocytes from panel J was quantified (n = 500 cells). (L) Epididymal adipose tissue from 4-week-old WT and KO mice was extracted and subjected to qRT-PCR to determine the indicated mRNA levels (n = 5 WT mice and n = 5 KO mice). All data represent the mean ± SEM. *P < 0.05 and ***P < 0.001, by Student’s t test.